Camden Oak Crest offers spacious one, two and three bedroom apartment homes only minutes away from the Energy Corridor and Westchase District. Our West Houston apartments put you close to shopping and dining at City Centre and the Galleria and are zoned to the Alief Independent School District. Unwind in the beach-front entry pool with lap lane, entertain your friends at the social lounge with billiards or have a picnic at one of the outdoor grilling areas. Look and feel your best in the 24-hour fitness center and stay connected with Wi-Fi throughout all amenity areas. When you need a quiet place to get work done, visit our resident business center with a multi-functional printer and desktop computers. Our clubhouse is the perfect place to entertain friends with plenty of comfortable seating, a full-size kitchen, flat-screen TV and billiards table. Check out a virtual tour of the clubhouse here and start planning your next party! Each apartment feels like a home with thoughtful details like a full-size washer and dryer, stainless appliances, walk-in closets and garden tubs. Our pet-friendly apartment community also offers conveniences like covered parking and garages. Enjoy easy commutes to the Energy Corridor and Downtown Houston via the Westpark Tollway and Highway 6 and live just minutes from US-59, I-10 and Beltway 8. Nearby grocery stores include Whole Foods, Sprouts, and HEB, as well as the Westchase District Farmers Market. Shopping, dining, entertainment and public transportation are all within walking distance. 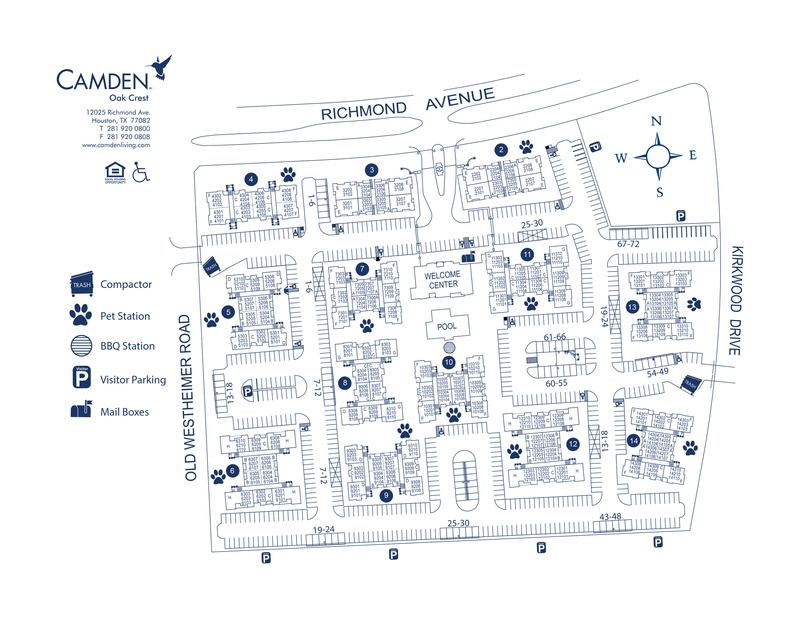 At Camden Oak Crest, you really can have it all! Interested in Houston's best 55+ apartment community located just minutes from Camden Oak Crest? Check out our sister community, Camden Royal Oaks! Restricted breeds: American Pit Bull Terrier, American Staffordshire Terrier, Staffordshire Bull Terrier, any mix of the previous breeds, or any other dog or breed deemed aggressive. Please refer to leasing office for more details. We'll save a spot for you! We offer one parking permit per registered vehicle with a designated area for visitor parking. Detached garages are available to rent for $80 per month and carports are available for $35 per month.